Hello SkyPeople, I am Jason from TronLive. Nice to meet you. Before we start this interview, can you give us a brief introduction of yourself? S : Hello, this is Sean from the Skypeople. I work as the Business Development Manager here, and this is Young-ho the CTO of Skypeople. He will be answering the technical matter about the TRON. Y : Hello, this is Young-ho who is taking charge of CTO in Skypeople. Nice to meet you. 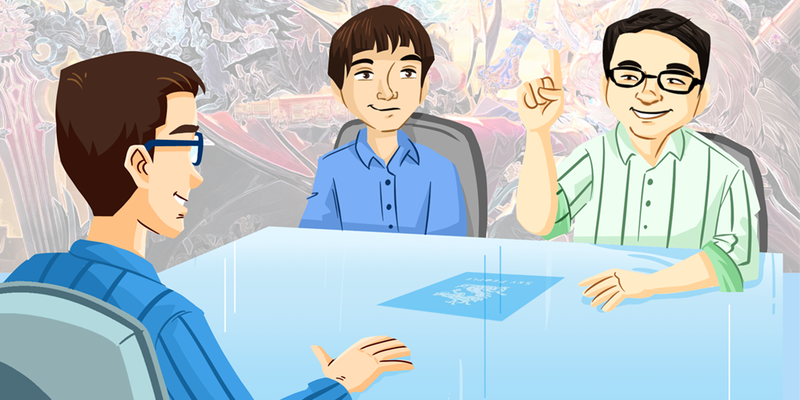 Our company is game creating company which we have launched <FINAL BLADE>, and I joined the party in early development. <FINAL BLADE> is in preparation to launch in Taiwan, and we are developing the blockchain technology. Skypeople is made up with young man-powers, fast at learning the new technology, and love to have a new challenge. Let’s talk about Final Blade since this is quite a popular game recently. So, What is Final Blade? S : <FINAL BLADE> is oriental designed RPG game. Servicing in Korea, we have recorded 2nd place in Google Play, and sales of 17 million dollars. As a launching in Taiwan in mid-June, we are planning to go global. We know that your team is from Korea, how is TRON in Korea’s market, how do Koreans think about TRON in general? S : As you can see it from Korean cryptocurrency market, TRX always stays in high position of trading quantity. However, most of Koreans do not know the technical part of TRON. Many Koreans know the TRON as Justin Sun. Haha ya, Justin is like the icon of TRON. Anyway, why did your team decide to join TRON SR? Y : Less usage of cryptocurrency was our constant concern, and making the place to use the cryptocurrency is in our plan. We are self-developing the blockchain technology, and also have a game SDK that is in early development stage. This SDK will contain the blockchain technique which all people can utilize. Some non-technical may not know what SDK is, can you tell them? SDK is Programming tool that can be used in the game using our blockchain technology. For those who are still wondering, SDK stands for Software Development Kit. Anyway, how do you think gaming industry can help in the ecosystem of TRON? Y : About the Game industry, the technique to process the numerous data is very important. Game industry will utilize the TRON’s ecosystem performance to maximum capacity and see if they can handle it. Through the maximum push, we will evolve one step more along with TRON. The community will look forward to it. Since Skypeople is based in Korea, will you have updates of your TRON SR activities in other languages so more potential international supporters can support you? S : We SKYPEOPLE have various talented men ready. Language of Korean, English, and the Chinese can be supported. Awesome, will you have any activities to promote this SR event and let more user know about Skypeople? S : Before the Super Representatives election, there was the meet-up planned. But the most of interview content were similar with the meet-up, so it got cancelled. After the SR election, we are planning to have bigger volume of meet-up. That’s good. In general, why do you think Tronics should support your team? S : Throughout the SR candidates, we are the only Korean company and we think it is the best chance to make an influence of TRON in Korean Market. If we become the 27 of SR, Korean TRON investors will have the another community entrance. Also, through the blending of the blockchain and the game we are making, we will try our best to give more rewards back to our supporters. Great! What can Skypeople do specifically to help the growth of TRON, do you think you will have a TRON based game developed? Y : We won’t stop making the game. SDK will be built in our next game, and it will contain TRON as well. Main feature would be “the payment” and “the Item Market”. And this SDK will be open to GITHUB so any kinds of game will have an access to apply. Also, the blockchain tech will be applied to the game data and server processing step by step. This is the process to decentralize the whole data, and I think the future server-less architect is the blockchain. Great, great. Before we end the interview, is there any last words for the community? S : SR is our “Beginning”. We will make the “Process” and the “Result” to highly compensate the voters who support us. Oh, and also we have a Telegram channel running, so join us! Don’t forget to vote for us! SKYPEOPLE! TO THE MOON!